April 6, 2017 Alumni, Aviation, Corporate Relations, Students, Transportation & Natural Resources Technologies Comments are disabled after 182 days. 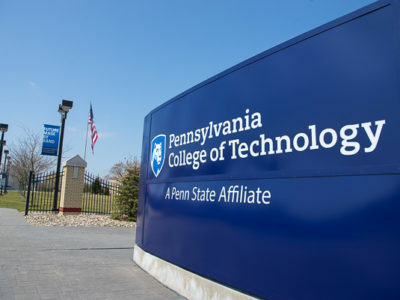 A generous donation of $275,000 worth of airplane parts will enhance the real-world instructional environment for aviation students at Pennsylvania College of Technology. David J. Barr, a quality management inspector with Airbus who graduated from Penn College with an aviation technology degree in 1997, brought the equipment to the Lumley Aviation Center hangar during the fall semester. Alumnus David J. Barr (right) is joined by Brett A. Reasner, Penn College’s dean of transportation and natural resources technologies, after delivering a sizable equipment donation from Airbus to the Lumley Aviation Center. Barr also met up with his son, Christain A., an aviation technology major at the college. The shipment comprised a moveable flap fairing, two trailing-edge assemblies and a wing-to-body fairing, as well as structural maintenance documentation. While delivering the equipment to the Montoursville center east of main campus, Barr and his wife, Ruth A., connected with their son, Christain A., who is enrolled in the aviation technology major at the college. Students look over part of the Airbus donation in the Aviation Center hangar. Airbus is a multinational aerospace corporation with production and manufacturing facilities in Europe, Asia and the United States. For more information about aviation-related majors in Penn College’s School of Transportation & Natural Resources Technologies – a bachelor’s degree in aviation maintenance technology, an associate degree in aviation technology and a certificate in aviation maintenance technician – call 570-326-4516.